A corneal foreign body is an object (eg, metal, glass, wood, plastic, sand) either superficially adherent to or embedded in the cornea of the eye (see the image below). The removal of a corneal foreign body is a procedure commonly performed in the clinic or emergency department setting. If corneal foreign bodies are not removed in a timely manner, they can cause prolonged pain and lead to complications such as infection and ocular necrosis. An intraocular foreign body penetrates into the anterior chamber of the eye or into the globe itself. It is likely to cause significant morbidity and, thus, necessitates a through workup, including, in many instances, a detailed ophthalmologic evaluation with imaging such as plain radiography or CT scan of the orbits. Though MRI is occasionally used, it is contraindicated if a metal foreign body is suspected. 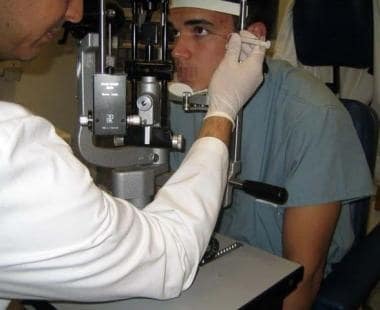 The patient’s description of the circumstances of the injury is the most crucial element in determining the likelihood of globe penetration, which would necessitate referral to an ophthalmologist. [3, 4] An intraocular foreign body does not necessarily change visual acuity. Corneal foreign body removal is indicated when a foreign body is on the cornea. Patients who present to the emergency department with emergent conditions should be referred to an ophthalmologist on the day of presentation. Patients with urgent conditions can be seen the following day. Anesthesia is necessary prior to foreign body removal and usually facilitates the initial eye examination. Instill a topical anesthetic ophthalmic solution (eg, proparacaine 0.5% [Alcaine, Ophthetic]). Eye spud (specialized equipment designed for the removal of corneal foreign bodies). The tip is less sharp than a needle, so iatrogenic injury is less likely to occur during the procedure. A sterile 25-gauge needle, placed onto a syringe (1-3 mm), can be used. Some clinicians like to bend the needle at a slight angle. 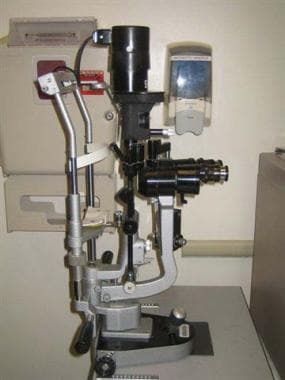 Slit lamp needed for corneal foreign body removal. Equipment needed for corneal foreign body removal. Have the patient press his or her face against the forehead strap and chin rest as demonstrated below so that the patient cannot move his head (and, hence, eye) forward toward the eye spud or needle during removal of the foreign body. This positioning is critically important. The clinician’s hand should be similarly anchored, either against the patient's face or on part of the slit lamp itself. Again, this prevents the clinician from inadvertently penetrating the patient's cornea with the spud or needle during the procedure. When removing an object from the left eye, place hand on the left maxillary bone. When removing an object from the right eye, place hand against the bridge of the nose or the infranasal aspect of the face. Explain the procedure, benefits, risks, and complications to the patient or the patient’s representative and obtain informed consent. Place 2 drops of anesthetic ophthalmic solution inside the lower eyelid. See image below. Application of anesthetic ophthalmic solution. Wet the fluorescein strip. See image below. Apply a wet fluorescein strip inside the lower eyelid to instill fluorescein onto the cornea. Under ultraviolet light, examine the cornea to locate the foreign body. Document a negative Seidel sign. (A positive Seidel sign indicates corneal penetration with oozing aqueous humor; it appears under ultraviolet light as a "dark waterfall," clearing away excess fluorescein on the cornea.) See image below. Instilling fluorescein onto the cornea. Inspect the lower eyelid while the patient looks up. See image below. 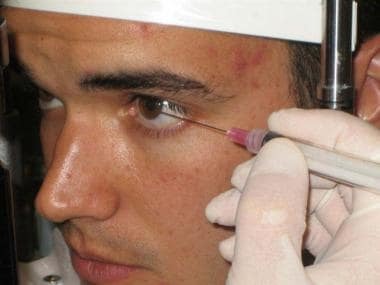 Inspect the upper eyelid by everting with an applicator while the patient looks down. Sweep the recesses of the upper conjunctival fornix. See image below. If the foreign body is superficial, irrigate the eye to moisten the cornea and attempt to remove the foreign body by using a gentle rolling motion with a wetted cotton-tipped applicator. Take care not to apply pressure, which may push the foreign body deeper into the cornea, or scrape, which may create a large corneal abrasion. See images below. Removal of foreign body with wetted cotton-tipped applicator. An embedded foreign body cannot be removed with irrigation or with a cotton-tipped applicator. See image below. An embedded foreign body can be removed by using a gentle flicking motion with an eye spud, if available, or with a 25- or 27-gauge needle. Place the hub of the needle on the tip of a cotton swab or a 3-mL syringe. Approach the cornea from the side, with the needle in a plane tangent to the cornea and the bevel away from the corneal surface. This minimizes the chance of corneal perforation. Once dislodged from its embedded position on the cornea, remaining corneal debris can be removed with a wetted cotton-tipped applicator. See images below. Removal of embedded foreign body with needle. Removal of embedded foreign body. Document a negative Seidel sign after the foreign body is removed. Ophthalmic antibiotic ointments (eg, bacitracin, ciprofloxacin) have an advantage by functioning as a lubricant. Be sure to choose a fluoroquinolone antibiotic if the patient wears contact lenses, as the risk of a Pseudomonas infection is higher. Ophthalmic solutions (eg, sulfacetamide, ofloxacin) are easier to apply and, therefore, enhance patient compliance. Corticosteroid ophthalmic solutions or ointments should be avoided because they increase the likelihood of superinfection and slow healing. Opioid analgesic agents (eg, hydrocodone/acetaminophen [Vicodin], oxycodone/acetaminophen [Percocet]) can be used to relieve moderate to severe pain and have been found to allow patients to sleep more comfortably at night. The use of patching has been controversial. Most recently, studies have shown that corneal abrasions due to a foreign body are best treated without eye patching. 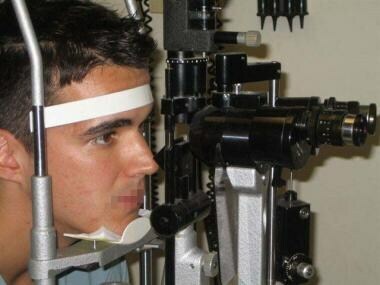 [10, 11, 12] Patients note faster healing, less blurred vision, and even less pain without an eye patch. Add this lack of proven benefit to patient inconvenience, and the only possible reason to use an eye patch is to protect abrasions that cover greater than 50% of the cornea. Use the Seidel test to look for hidden globe penetration when it is not obvious. In the case of a positive Seidel sign, the oozing aqueous humor at the site of penetration through the cornea appears under ultraviolet light as a "dark waterfall," clearing away excess fluorescein on the cornea. A positive Seidel sign indicates globe penetration and requires emergent ophthalmological consultation. Documenting a negative Seidel sign after the removal of a corneal foreign body is good practice, especially after using a sharp instrument, to confirm that no iatrogenic penetration of the cornea occurred during the procedure. Babineau MR, Sanchez LD. Ophthalmologic procedures in the emergency department. Emerg Med Clin North Am. 2008 Feb. 26(1):17-34, v-vi. [Medline]. Rothman M. Orbital trauma. Semin Ultrasound CT MR. 1997 Dec. 18(6):437-47. [Medline]. Gumus K, Karakucuk S, Mirza E. Corneal injury from a metallic foreign body: an occupational hazard. Eye Contact Lens. 2007 Sep. 33(5):259-60. [Medline]. Macedo Filho ET, Lago A, Duarte K, Liang SJ, Lima AL, Freitas D. Superficial corneal foreign body: laboratory and epidemiologic aspects. Arq Bras Oftalmol. 2005 Nov-Dec. 68(6):821-3. [Medline]. Roberts JR, Hedges RJ. Ophthalmologic procedures. Clinical Procedures in Emergency Medicine. 4th ed. Philadelphia, Pa: WB Saunders; 2014. 1259-97. Waldman N, Winrow B, Densie I, Gray A, McMaster S, Giddings G, et al. 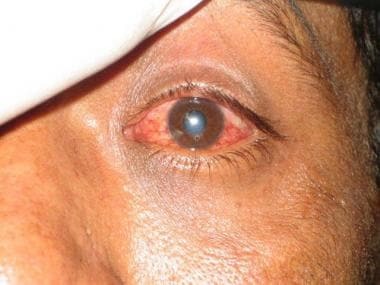 An Observational Study to Determine Whether Routinely Sending Patients Home With a 24-Hour Supply of Topical Tetracaine From the Emergency Department for Simple Corneal Abrasion Pain Is Potentially Safe. Ann Emerg Med. 2017 May 2. 21:374. [Medline]. Pruet CM, Feldman RM, Kim G. Re: "topical tetracaine used for 24 hours is safe and rated highly effective by patients for the treatment of pain caused by corneal abrasions: a double-blind, randomized clinical trial". Acad Emerg Med. 2014 Sep. 21 (9):1062-3. [Medline]. Weaver CS, Terrell KM. Evidence-based emergency medicine. Update: do ophthalmic nonsteroidal anti-inflammatory drugs reduce the pain associated with simple corneal abrasion without delaying healing?. Ann Emerg Med. 2003 Jan. 41(1):134-40. [Medline]. Arbour JD, Brunette I, Boisjoly HM, Shi ZH, Dumas J, Guertin MC. Should we patch corneal erosions?. 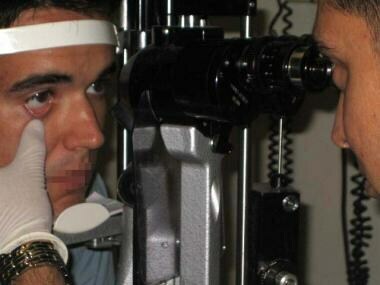 Arch Ophthalmol. 1997 Mar. 115(3):313-7. [Medline]. Wilson SA, Last A. Management of corneal abrasions. Am Fam Physician. 2004 Jul 1. 70(1):123-8. [Medline]. Turner A, Rabiu M. Patching for corneal abrasion. Cochrane Database Syst Rev. 2006 Apr 19. CD004764. [Medline]. Srinivasan S, Murphy CC, Fisher AC, Freeman LB, Kaye SB. Terrien marginal degeneration presenting with spontaneous corneal perforation. Cornea. 2006 Sep. 25(8):977-80. [Medline]. Reichman EF, Simon RR. 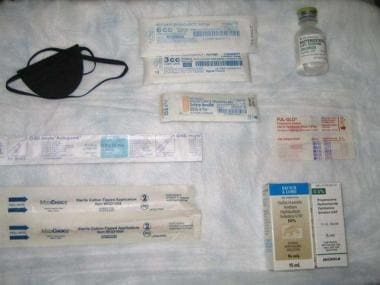 Emergency Medicine Procedures. 2nd ed. Columbus, OH: McGraw-Hill; 2013. Thanks to Ryan B Viets for being the volunteer for the images. The authors and editors of Medscape Drugs & Diseases gratefully acknowledge the assistance of Lars Grimm with the literature review and referencing for this article.